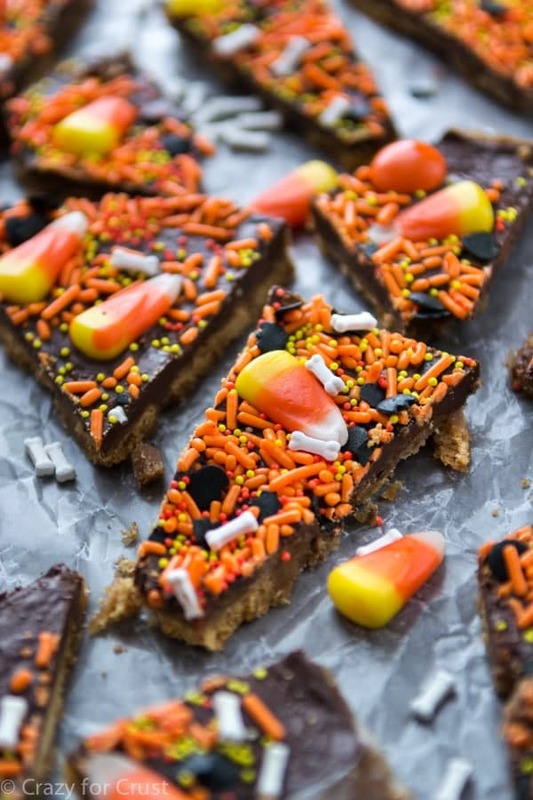 Toffee, graham crackers, and Halloween sprinkles make this Halloween Toffee Bark the most festive candy ever! There are only a handful of desserts that my husband will consider eating: peanut butter cookies, ice cream, carrot cake, and toffee. In fact, if you read this blog at all, you’ll know he rarely eats anything I make – even those favorites. People say to me all the time “your husband must love everything you bake!” Nope, he rarely ever eats it. And you’ll bet your bottom dollar I’ll tell you if he does. Anyway, a few weekends ago I had my book launch party (photos coming soon!) and one of the recipes I served was Chocolate Chip Cookie Toffee Bark. It’s a recipe from my book and it’s so freaking good. It’s so good that it lasted about 10 minutes at the party. Here’s where Mel comes in. He doesn’t eat dessert, like, ever. His willpower is incredible. But he had told himself he’d have one piece of toffee at my book party. Just one piece. But by the time he got over there to get his one treat for the month…it was all gone. Toffee bark is my absolute favorite thing to make at Christmas. 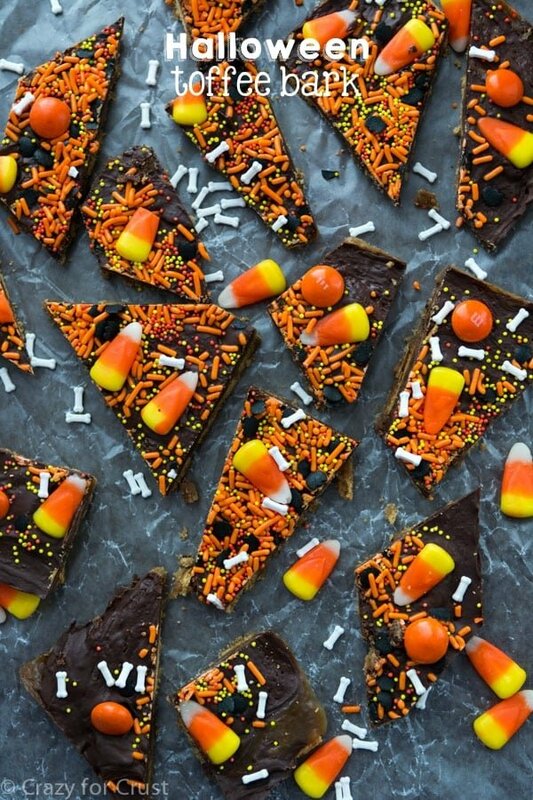 Since Halloween is the candy holiday, it makes sense that it needs it’s own version of toffee bark, right? What makes this recipe different than actual toffee is the “bark” part. And what makes up the bark? Some sort of cracker base. I’ve made this with matzo crackers. In my book I use Chocolate Chip Cookies. For this bark I used graham crackers. Those are another thing that Mel loves: graham crackers. 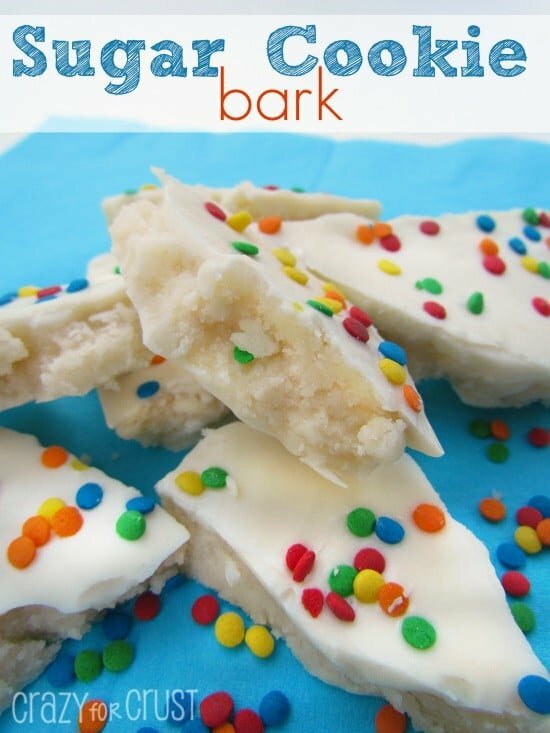 The bark is super easy to make. You need a rimmed baking sheet (I use my jelly roll pan). You line that sheet with graham crackers. That’s when the real fun happens – the decorating! You really can use any kind of decorations you want for this bark. Candy corn, sprinkles, M&Ms, you name it. You’re also not limited to Halloween. Think Christmas, Valentines Day, rainbow sprinkles…the possibilities are endless. But I can guarantee you one thing: when you make this, it won’t last long. Just ask Mel. He knows that quite well! 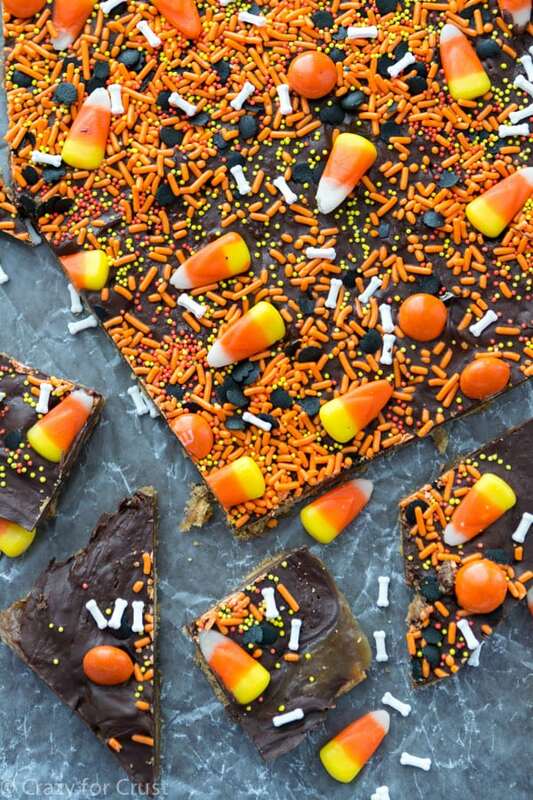 This Toffee Bark is made with graham crackers and topped with everything Halloween: sprinkles, candy corn, and M&Ms. Make up a bowl to serve at a party! Preheat oven to 350ºF. Line a 10x15” pan (jelly roll or cookie sheet with sides) with foil and spray well with cooking spray. Lay the graham crackers in a single layer in the pan, breaking a few to fill in the edges and gaps as much as possible. Melt butter in a saucepan over medium heat. Turn to medium-low and add brown sugar and water. Bring to a boil, stirring occasionally. Once it boils, place the candy thermometer in the pan and do not stir. Let the mixture cook until it reaches 255ºF on a candy thermometer, about 5-7 minutes. Remove from the heat and stir in vanilla extract. Immediately pour over cookies and spread carefully to cover all the crackers. Bake for 5 minutes. Remove the pan from the oven and sprinkle with the chocolate chips. Bake an additional 2 minutes. Remove the pan from the oven and, using an offset spatula, carefully spread the chocolate chips evenly over the toffee (they will have melted in the oven but still held their shape). Sprinkle your Halloween sprinkles and/or candies over the chocolate. Let cool to room temperature, then chill to set. Break into pieces and serve. This bark looks super cute, Dorothy! 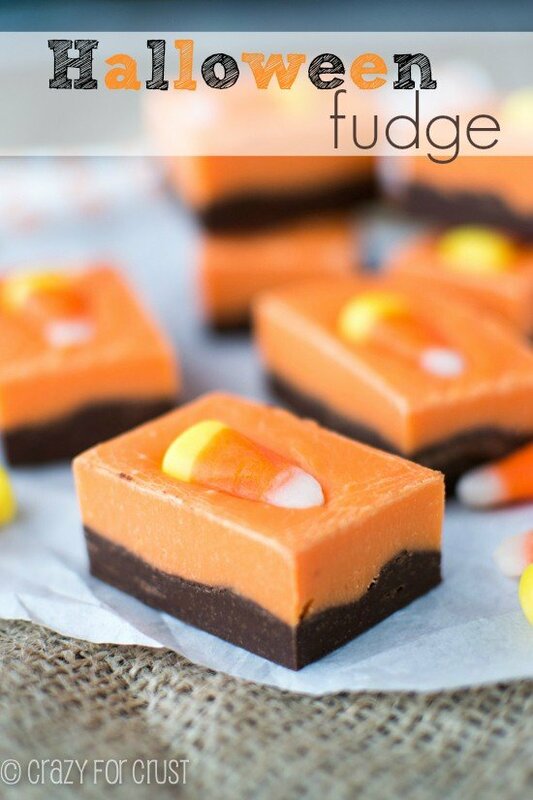 Love halloween recipe ideas like this! RIGHT? So hard to get rid of it all! This is so great for Halloween, love the little bones! This looks so festive and colorful for Halloween. It would be great to have at a halloween party or any gathering. 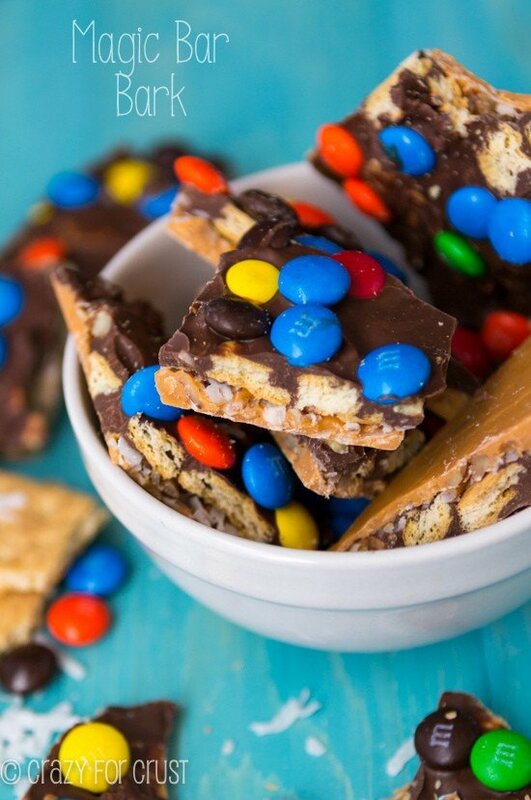 Love this toffee bark! It’s so pretty and festive – perfect for Halloween! And those adorable little bone sprinkles? The CUTEST! So sweet of you to make this batch just for Mel too:) Pinning! I’m with Mel- I LOVE graham crackers! I know that’s weird, and probably makes me sound like a Kindergartener, but I just love them. Dessert island- two foods for life- graham crackers are there. Along with chocolate covered pretzels. 😉 haha Love this Halloween version. The sprinkles are too cute! I had a question about cooking the toffee cause I want to make sure I don’t mess this up when I do it. Do I cook it 5-7 minutes (or until it reaches 255F) or do I cook it at 255 for 5-7 minutes. I was a little unclear on that part. Thanks. Dorothy, you weren’t kidding about the white chocolate not working! I didn’t read that until I was getting ready to make it, so I figured I would give it a try anyways. Definitely doesn’t work! I kept it in the oven longer, hoping that would help it spread, but no luck. I finally gave up and decided it was just going to have to be sprinkled instead, lol. Have you tried using white candy melts instead? I think next time I’m going to try melting the white chocolate separate and then just pouring it on when the toffee is done. I haven’t tried the melts – let me know if they work! I’ve been making variations of this for the past few years, adding different extracts and toppings – white chocolate is finicky! the secret, I found, is to let the toffee cool enough to stop bubbling and letting off steam before sprinkling the chips, otherwise the moisture makes the chocolate seize. good luck! Good to know, thank you! I totally hate melting white chocolate. It’s so frustrating! Do you have any idea if this freezes well? I haven’t tried freezing it, but I think it would work. The chocolate may dull once it defrosts though! Just made this recipe, delicious! I did Christmas theme goodies on too 🙂 Yum!